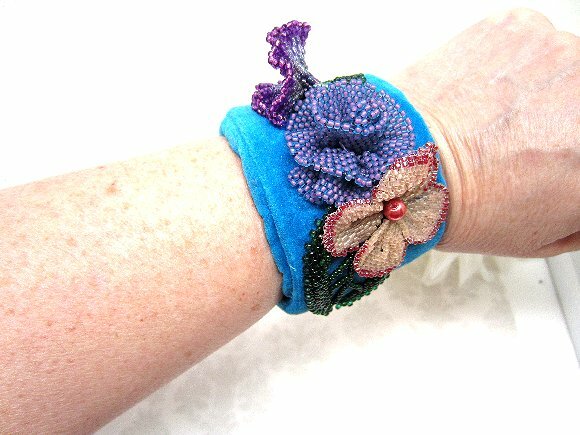 Wearing this velvet covered adjustable cuff bracelet is like having a garden on your wrist. 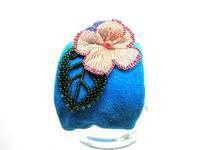 Each flower and leaf is made by hand by painstakingly weaving tiny beads into place one at a time. The result is a cuff bracelet that's floral bonanza in purples and pinks, along with a pair of dark green leaves. They?re appliqued to luscious peacock blue velvet. 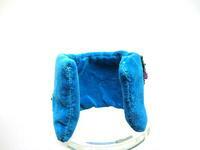 The velvet surrounds a bendable brass cuff that will adjust to fit most wrists. 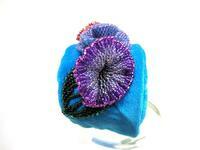 Gorgeous yet comfortable, it?s another versatile cuff bracelet from SPARKLE PLENTY.